Tim Smalley was one of our early subscribers and Dav Thomas and I had already met him when he came on one of our one to one workshops (actually two to one - we like intimidating our clients). He's an engineer by training (studied for degrees in material science and computational science) but has ended up as an entrepreneur who develops online businesses for a living. 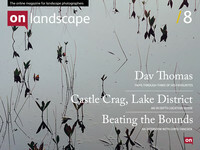 He's now on his third business, a new online magazine which has some photography connections, but still finds time to get out into the landscape. We asked Tim where his photography currently stands and he mentioned that the new business was getting in the way a little, so much that despite having his own printer, he has decided to farm out his print services in order to optimise his available time, just printing a reference to give to the supplier (wise move). Tim got into the outdoors from an early age as a scout and cub and his first camera as a 'back of a cereal box' offer which was upgraded after using the schools SLR camera and experiencing the magic of seeing a print appear in a darkroom tray. The SLR was used as part of a GCSE art project photographing tree stumps - the germs of a landscape photographer in the making. Once the GCSE's were out of the way, a Canon EOS300 followed and was used for a couple of years at college where he also went on his silver and gold Duke of Edinburgh awards in Glen Shiel and Glencoe (and another course in Skye) - how could you not fall in love with Scotland after seeing those places! Moving to London for his first degree killed things off a little, his old camera got sold and he ended up borrowing a camera from a friend for what little photography he managed. It was at university that the 'internet entrepreneur' appeared, developing a now famous techy website bit-tech.net. He started another degree in Loughborough once this degree was finished but ended up leaving early because of the success of the web business. Losing a loved one provided the trigger for his re-engagement with photography. The lack of photographic memories urged him to get back into photography, especially landscape and things took a significant step when he finally got a 'professional' tripod. This period coincided with the purchase of "Developing Vision and Style", a book that he said inspired because it was about the art of aspirations of photography. He now uses a Canon 5Dmk2 with a range of lenses - 24 and 45 tilt shifts (the 24 being the new version of which we were both singing praises). An old 28-70 is the zoom workhorse and a 70-200 2.8 provides the long end of the range. When out in the field he uses a Panasonic LX3 and an Olympus Pen to compose with and the Canon to finalise the picture. He's recently started a project of ice features and the idea of working to a theme appeals. I'd like to thank Tim for his willingness to participate in this feature and I urge you to take a look at his website and flickr stream which can be found at http://tsmalley.com/ and http://www.flickr.com/photos/timsmalley/.